Book directly with us and receive a $30 food voucher with each night's stay, the best happy hour in town from 3-6, live music nightly from 7-10, and 30% off dinner entrees at our award-winning Mad Batter Restaurant. Spring Fling is back again! The groundhog didn’t see his shadow, which means spring is arriving early this year! 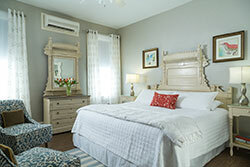 Come enjoy a mid-week stay Sunday through Thursday in Historic Cape May. Book one night and get the second night 50% off! Included with this deal is a bottle of wine upon arrival, 2 Historic District trolley tour tickets, a wine tasting at Hawk Haven Vineyards & a $30 breakfast voucher for each morning of your stay/30% off dinner entrees at our award winning restaurant, The Mad Batter! Valid March 3rd – May 2nd. Available for any King or Queen rooms, excluding rooms: 4, 6, 13, 21, 20, & 28. This offer cannot be combined with other special offers or third party gift certificates. Blackout dates: March 31st & April 14th & 21st. We are proud to offer a Thursday night stay for the families of graduating Guardsmen. Please note only a select number of rooms can accommodate more than 2 guests, if you have additional guests, please call us to book your reservation. Not available from May 15 thru October 15. 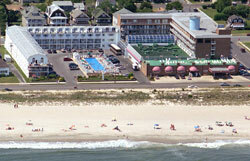 Bring the family to Cape May for an exception vacation experience at The Grand Hotel. Our June Midweek Family Special includes deeply discounted room rates (up to 40% off our regular rates for a 5 night stay) plus other included perks such as breakfast every morning, dinner one evening, and your choice of two All Day Amusement Pier Passes for Moreys Piers In Wildwood OR a four passes for an adventure on one of Cape May’s delightful Dolphin & Whale Watching cruise boats! * Adults Dinner includes soup or the day OR house salad, choice of any entrée selection from the normal Hemingway’s menu, chef’s dessert. Child Dinner includes any entrée selection from the Hemingway’s children’s menu. ** Water Parks, Go-Carts, Sky Coaster, Spring Shot and Sky Scraper not included in Pier Passes. Available June 2nd through June 27th, 2019. 2 and 5 night reservations must arrive Sunday. 3 night reservations must arrive Sunday OR Tuesday. May not be combined with other specials or offers. Reservation must be booked directly with The Grand Hotel. Does NOT apply to reservations made through 3rd party websites (Booking.com, Expedia etc.). Limited availability. Bring the family to Cape May for an exception vacation experience at The Grand Hotel. Our July Midweek Family Special includes deeply discounted room rates (up to 20% off our regular rates for a 5 night stay) plus other included perks such as breakfast every morning, dinner one evening, and your choice of two All Day Amusement Pier Passes for Moreys Piers In Wildwood OR a four passes for an adventure on one of Cape May’s delightful Dolphin & Whale Watching cruise boats! Available June 30th through July 25th, 2019. 2 and 5 night reservations must arrive Sunday. 3 night reservations must arrive Sunday OR Tuesday. May not be combined with other specials or offers. Reservation must be booked directly with The Grand Hotel. Does NOT apply to reservations made through 3rd party websites (Booking.com, Expedia etc.). Limited availability. Experience the BEST Kid's Spring Break on the Beach in Cape May! The Grand Hotel & Eco Venture’s Kid's Adventure Camp are teaming up once again to offer great times for the entire family. This promotion is available Sunday April 14th through Saturday April 27th, 2019. To learn more about EcoVentures visit www.ecoventuresus.com. EcoVentures Camp is NOT available Friday, Saturday or Sunday. * "Family" includes two adults and up to two children 12 years old and under in same room. Rates quoted are Sunday through Thursday, weekends higher. 2 night minimum stay. Does not include taxes or gratuities. Subject to availability. Rate base on room types E and F, other room types higher.